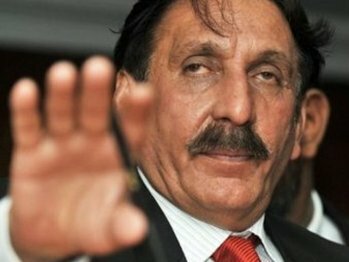 ISLAMABAD – The government has started confrontation with the Supreme Court by not implementing its orders, Chief Justice of Pakistan (CJP) Iftikhar Muhammad Chaudhry said on Tuesday. The chief justice was heading a seven-member special bench comprising Justice Javed Iqbal, Justice Tassaduq Hussain Jillani, Justice Raja Fayyaz Ahmed, Justice Muhammad Sair Ali, Justice Ghulam Rabbani and Justice Khalilur Rehman Ramday, which was hearing a suo motu case against the alleged corruption in the Haj arrangements. The court directed the government to ensure that all senior officials, including FIA DG Waseem Ahmed and Sindh IG Salahuddin Babar Khattak, inducted on a contractual basis are removed by February 18 and that it should render the services of those senior officials until new recruitments. The court directed Abdul Hafeez Pirzada, counsel for the federation, to submit a compliance report with the Registrar’s Office. When the court inquired Attorney General Moulvi Anwarul Haq about the implementation of the court’s earlier order for the removal of contractual officials, Pirzada told the court that the PM had sent the matter to the Law Ministry. “The government has started confrontation with the judiciary by not implementing its orders in letter and spirit”, the chief justice noted. However, Pirzada submitted that the government’s job was to stop any confrontation, adding the matter was pending before the Law ministry, as the prime minister was currently out of country. He pleaded the court to separate the issue from the Haj corruption case. The chief justice, however, declined the request observing that the matters could not be separated as the contractual employees had affected the case. He noted that the induction of officials on a contractual basis had discouraged the induction of young and deserving candidates on key positions. Justice Rabbani observed that with the trend of appointments on contractual basis, most of the educated and talented youngsters preferred to go abroad. During the hearing, the court also asked the AG to ask the prime minister why action had not been taken against the accused of LNG scam. The court also noted that the summary on FIA DG Waseem Ahmed’s contract stated that he had been given an extension in the service for making an important development in the investigation of Zakiur Rehman Lakhvi, an accused of Mumbai attack case. The chief justice noted that the challan was presented before the court prior to his appointment as FIA DG and even the SC had disposed of the matter prior to Waseem’s appointment in FIA. The court said the summary was based on lies and directed that action must be taken against the creators of the summary. Later, the court adjourned hearing until March 1.